This weekend sees the start of late availability discounts for self cater May Half term holidays in Cornwall. Why not take advantage of the holiday and book your self an extra special property. Set amongst rolling countryside in an Area of Outstanding Natural Beauty, Cob Cottage at Higher Tregidden provides the perfect base for your holiday exploring the Lizard and Southwest Cornwall. At Gwendreath, enjoy unrivalled panoramic views, with amazing beaches at Kennack Sands & Kynance Cove just a short distance away. Escape to England's most southerly point, a truly wonderful place of unspoilt, rugged beauty. Close to the tip of the Lizard Peninsula this superb converted farmhouse is a dramatic place to stay in this amazing location. 1 x double, 1 x travel bed if required. 3 x bedrooms each with a double and a single. The Mealhouse is a converted barn that was originally a grain store and cow barn. There is a beautiful walk through fields and woods down to the stunning sandy beach at Crackington Haven. The barn itself is bright and spacious with three bedrooms, a large bathroom with a claw footed free standing bath. 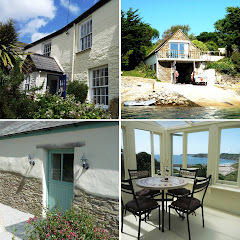 A 20% discount is available for up to, four people booking outside school holidays. Awarded Bronze in the 2014/15 Cornwall Tourism Awards!